Facebook’s “Explore” page, moving published posts off of the news feed, spells trouble for independent media. 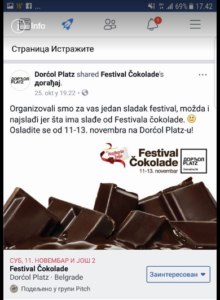 Facebook’s experimentation with a feed that would sideline everything but user-generated content and paid posts is threatening to separate independent journalists and civil society representatives from their audiences in Serbia. This is just one of the comments shared recently on Serbian social media in response to the changes that Facebook has introduced as an experiment in Serbia and five other countries. Unlike in the rest of the world, Facebook users in the six targeted countries—Bolivia, Cambodia, Guatemala, Slovakia, Sri Lanka, and Serbia—now see a feed that consists mainly of of private content shared by their friends and paid posts. News, among other content, has been relegated to a so-called “Explore Feed” (marked with a doodled rocket) in which a person can find posts from the publishers and businesses that they follow. The Facebook Explore feed, indicated by the rocket icon. Some commentators view the move as politically motivated, noting that Facebook, which was once considered a platform for the people, now seems to be catering its service to non-democratic governments. Others see it merely as matter of profit. However the motivation is perceived, all agree that if Facebook permanently adopts the changes, the consequences for independent news producers will be dire. “It feels like I was painting a mandala, grain by grain, only to see it blown by the wind in a single stroke. Now, sharing original content via Facebook seems a pointless endeavor, as there is no such a thing as ‘visibility’ anymore.” This post was shared by Luna Lu, the producer of a web-based TV series Talija, which draws nearly 22,500 followers on Facebook with its stories on urban lifestyles. Lu, a prominent Serbian journalist, was one of the early adopters of social media in Serbia, spending years to build the following that Facebook’s recent experiment could topple. According to Lu, since the changes were put in place in mid-October she has already seen a 64 percent decrease in the visibility of her web series. The experiment is all the more troubling as media freedom in Serbia has been on a steep decline recently. According to the European Federation of Journalists Serbia has the worst record of media freedoms violations in the region. In fact, the Federation recently announced that it will send the special delegation to the country in the near future to monitor the situation. With the government playing a dominant role in the media sector, tabloid newspapers and TV stations with national reach routinely run smear campaigns against independent media. Social Media Platforms Serve as Space for News Sharing and Organizing. What Will Happen Now? About a month ago, a prominent Serbian journalist Vukasin Obradovic announced a hunger strike to protest political pressures on his media outlet and diminishing media freedoms in the country. 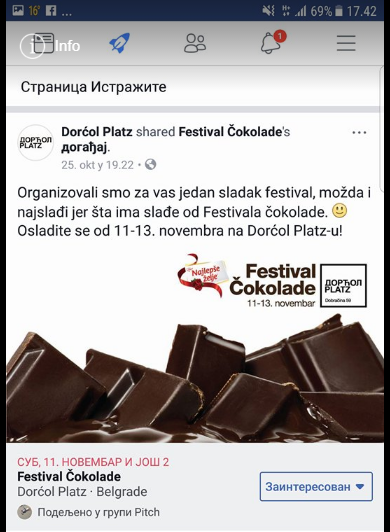 That triggered a spontaneous For Media Freedom campaign, the first of its kind in Serbia to successfully utilize social media to counter tabloidization and propaganda. The campaign is anchored by an active web page and Facebook page, and has made effective use of ad-hock video-clips recorded via smartphones with the hashtag “Why am I here” to endorse prominent journalists. The campaign also staged a blackout, in which many websites darkened their landing pages to protest the deteriorating media freedom situation in the country. The live-stream of the campaign launch was followed by nearly 30,000 users and drew participation from 400 organizations and individuals. This is why the recent Facebook experiment, which some advocates dubbed ‘downright Orwellian’ seems so incomprehensible. Media freedom advocates point out that the effect may be twofold. First, a significant number of people may be deprived of information. And second, a primary distribution channel for independent media may be lost. Ilir Gashi, a Program Director of the Slavko Curuvija Foundation that supports the work of independent media in Serbia, compared the changes to a closed-door newsstand: “Before, you could stand in front of the kiosk and browse newspapers and the magazines, reading the titles. With this change, the newspapers are still there, but you can’t really reach them unless you open the door and enter the store. Some or many people will simply not do that.” According to Gashi, the change not only imperils independent media in Serbia, but also NGOs and other critical voices without access to mainstream media. Vlada Radomirovic the editor-in-chief of the Serbian whistleblower website Pistaljka, told me that the recent Facebook experiment resulted in an 85 percent decline in his reach, and in a drop of jos page previews by 83 percent. According to the Atlantic, a Serbian website for social critique, Masina, witnessed a 58 percent decline of traffic on its Facebook page and a 72 percent drop in its interactions during the first week of the experiment. Valer Kot, Director of Media Advisory Services at the Media Development Investment Fund, said, “There is no question that the Explore Feed will have a huge impact on traffic of media outlets.” He went on to note that, “limiting the reach and ability of media to spark or influence a public discourse for masses of Facebook users,” will without a doubt influence democratic processes in the countries at stake. In his letter to investors from 2012, Mark Zuckerberg, the CEO of Facebook discussed the role of his company in the democratization of societies. He noted that “the power to share,” and people’s voices “cannot be ignored” by their governments. Let’s just hope that the same will hold true when societies such as Serbia need Facebook. Marija Šajkaš is a U.S. based writer, media expert, and political analyst, and founder of 4 Better Media. Follow her on Twitter at @Marija_Sajkas, and read more from her here.